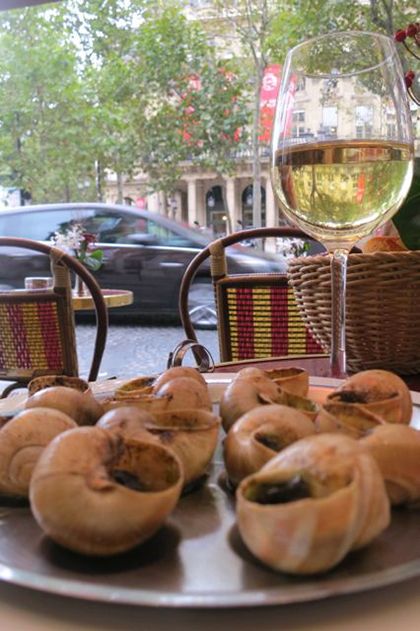 My favourite place in the world to enjoy escargot is in the little café across from Comedie Francaise in Paris. I always sit outside facing the theatre and the fountain. For me, it’s a place of memories combined with good wine and even better escargot. They’re the traditional escargot stuffed with garlic butter. The French baguette comes already sliced; I tear bits from it and dip it into the butter that inevitably runs all over the dimpled plate. My tall champagne flute gets greasy from buttery fingers and crumbs end up all over the plate and my lap. Anyone walking by can tell I’m really enjoying my snails. In Europe and parts of the United States there are farms that grow the most delicious snails but the reality is, most garden snails will do. My great uncle and his closest friend had a favourite spot they would go to and collect snails. Like a fisherman’s viciously guarded fishing spot, he would tell no one where he went. He’d bring them home and the elaborate preparation would begin; the giant bucket, the rinsing, the salting, the cleaning and the cooking. It took a few days but in the end, they were glorious! In our household, our snails were cooked in a combination of chicken stock and red wine. We ate them by the bowlful. 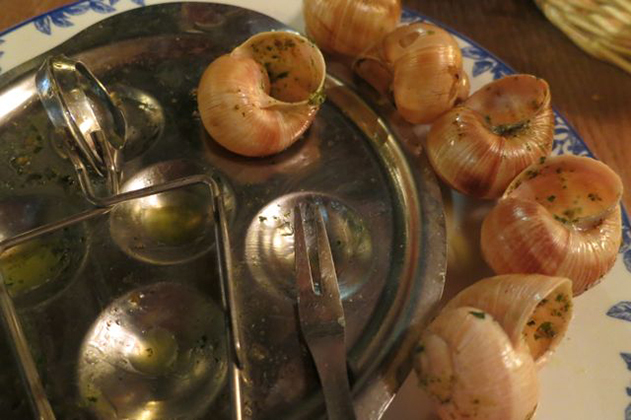 No one in my family would ever think to eat 6 little snails on a plate like the French; no that just wouldn’t do. We had giant bowls, tiny forks, bread for dipping and an empty bowl within throwing distance for the shells. When I was in Greece, I ate bowlfuls of snails simmered in a rich tomato sauce and it reminded me of my great uncle and his love of the little slugs. Snails are molluscs, like oysters and clams and whether you prefer garlic butter, red wine broth or tomato simmered, stay away from the snails served in a dimpled plate, covered with a thick layer of cheese. The cheese over powers the snails in both flavour and volume and overall the dish should make little sense to anyone with good taste. While I don’t hunt for snails like my great uncle, I often buy a tin of snails and make my own. No, I have no shells to put them in, instead I simply put the snails in the bottom of a tiny roasting pan the size of a ramekin, top them with a slab of butter, minced garlic and a huge teaspoon of fresh parsley. I roast these, covered, for 10 to 15 minutes or until I can hear the butter bubbling away. I have a fresh chunk of baguette next to my glass of prosecco and it’s a quick, easy and glorious meal to make anytime. Snails are very inexpensive to buy. I tin costs approximately $1.99. But beware, some of the escargot are the size of golf balls and you almost need a knife to cut them in half – these are awful! The best escargot are the size of an alley because then you get a good balance of the sauce flavours and the meaty, savoury, rich flavour of the snail. It’s a great balance that becomes heavenly when washed down with a sip of sparkling wine. If you’re not into making your own snails, there’s no better place to enjoy a dish of delicious escargot than the Paris Crepes Bistro in Niagara Falls. Chef Thiery has perfected the perfect balance of parsley, garlic and seasonings that swim in a beautiful bath of French cultured butter. The restaurant is sultry Parisian, the food exceptionally fantastic and the chef wanders the table romancing his satisfied guests with stories of food in Paris told with a strong French accent. It’s the best escargot in the best setting! Today is National Escargot Day. It’s a day to eat snails! 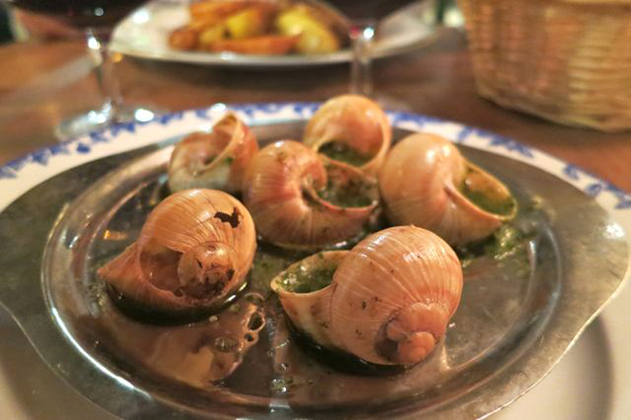 It’s a day to toast to previous generations of snail lovers and it’s a day to vow to eat escargot more often! Happy Escargot Day! I love a good wine event and a great glass of bubbly. 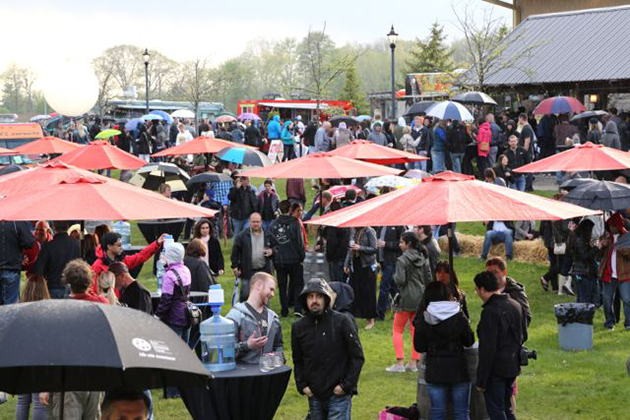 One of my favourite bubblies is Peller Estates Ice Cuvee so when I heard there was a food truck rally at Peller Estate Winery in Niagara-on-the-Lake, I was there! 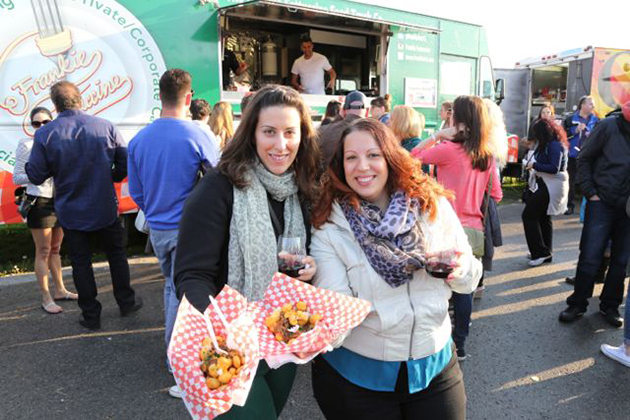 It’s the 3rd year for Peller’s Food Truck Eats where almost 20 gourmet food trucks from far and wide are sandwiched between the lush, corduroy vineyards and the posh, high-end restaurant, Peller Winery Restaurant. With glass of bubbly in hand I surveyed the grounds, the trucks, the wine stations, music area and tables that were scattered around the grounds for the most appropriate strategy. There were food trucks with long lines of customers, some with short lines and others with no lines but swarms of people. On the left was the DJ and a group of exuberant dancers, to the right a cupcake truck and all around, people were mingling, eating, sipping on fine wine among the busy food trucks. With no apparent strategy, I was on my own. I began walking around, reading menu boards in front of the food trucks. 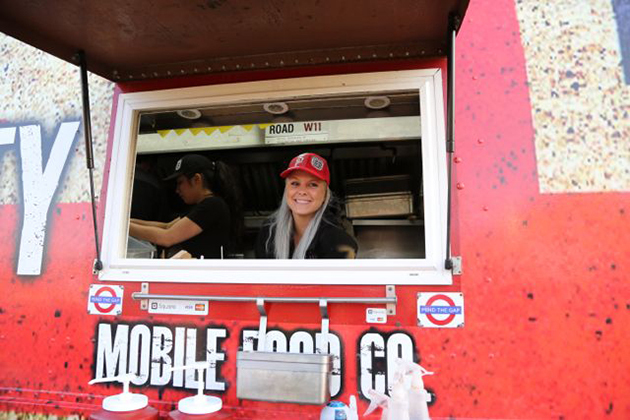 Now contrary to my first impression, a food truck rally is not the same as a traditional wine and food event where food stations prepare and hand out little bits of food so you can taste the talents of many chefs. No, at a food truck rally, food trucks pump out full meals at full prices forcing you to develop a sanity strategy – after all, one cannot eat it all! So I turned around and focused on the eaters instead of the food trucks. Everyone eating was happy to share what they loved about the food in front of them. It seemed like the more out-of-the-box or shocking the food, the more fun they were having. I approached eight diners squeezed around a table. 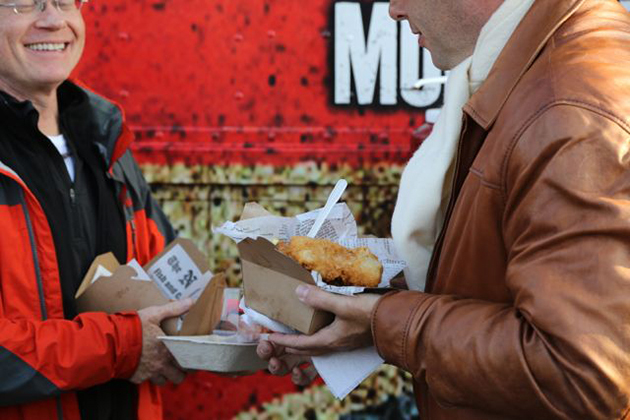 They raved about the giant, deep-fried, macaroni and cheese balls from the Food Dudes, others loved the monstrous English-style fish and chips from the Feisty Jack. The juice was dripping down from the porchetta sliders from the Rome’n Chariot while lips were being licked over Chang Noi’s Mossamengi (red curry soup). It was apparent I needed to call in reinforcements. I surrounded myself with three friends and we set out. I would order and taste, they would eat. It was that simple. Here’s what I chose from the dizzying amount of choices parked in front of me. I loved Buster’s Sea Coves Seared Ahi Tuna Tacos, the oysters from Tide & Vine Oyster Co, Salmon Tacos from El Gastrónomo Vagabundo and Pulled Pork & Cornbread Waffles from The Dirty South. Miso Pork and Kimchi Lettuce Wraps from Mind and Seoul and the Lobster Spring Fling Rolls from Chang Noi Enroute. In the end, I didn’t get to try any of the hundreds of grilled cheese sandwiches I saw devoured from Gorilla Cheese or the gnocchi from Frankie Fettucine. I wish I had room for the Shanghi Cigarrog from Lunchador and the wood oven pizza from Bestia Pizza Truck. Of course, I had no room for the Key Lime Pie from the Itty Bitty Pie Company nor the Red Velvet Cupcake from Curbside Bliss Cupcakes – pity. 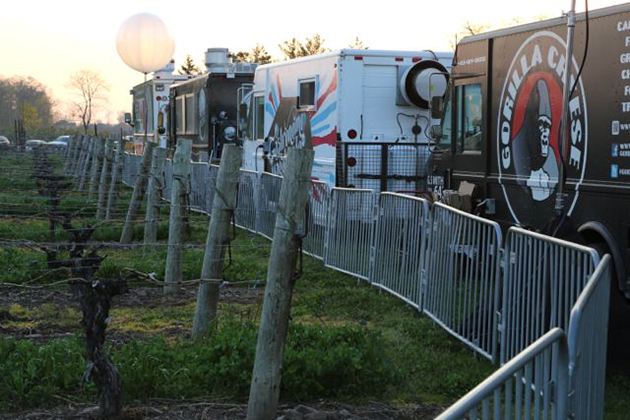 With my work only part way done, I look forward to next years Food Truck Eats at Peller Estate Winery. Ah Paris, a city of gourmet sights where baguettes walk through the streets in the hands, baskets and bags of almost every Parisian, where markets spill out onto the streets tempting those who walk by and pastry shops never put inches on your hips. The French capital is awash with wine; wine that is sold in plenty at every grocery store, corner store and farmers market. Yes, unlabelled wine bottles stand naked at markets in baskets in the hot sun, their hand written tags flapping in the breeze. Wine can be found for 2 Euros in the grocery store and 8 Euros on wine lists. 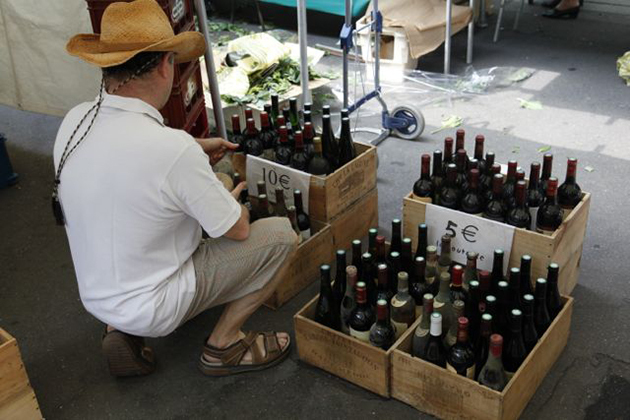 Wine in Paris is cheaper than water, gasoline and coke. Restaurant wine lists are like endless lists of names; of chateaus and varietals. As I worked my way through Paris I asked everyone I was close to what kind of wine they drank, I wanted a starting point that didn’t make me stand out in the crowd. I needed a reference point from which to begin my vinous journey, something where I wouldn’t stand out, but nothing. It seems as if Parisians like to drink all wine. The only commonality was that it was all French. Rue Suffren was my base camp. A beautiful two-bedroom apartment on the second floor of a 4-story building in a city with a sensible 6-story code. 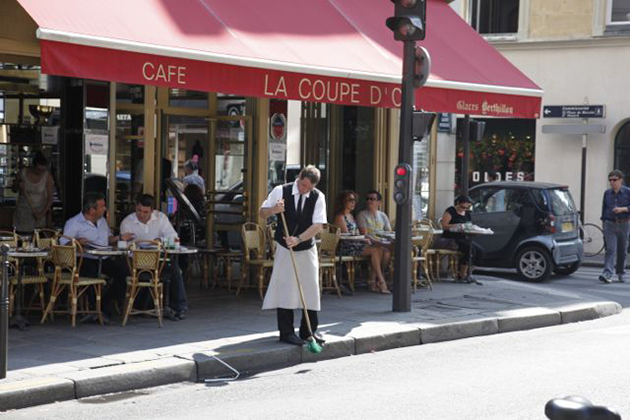 Rue Suffren runs parallel to the Eiffel Tower and is the street where the high ranking government officials and wealthy have their city homes – or so I’m told by the café on the corner where breakfast becomes a common occurrence. Of course my apartment was advertised as having a view of the Eiffel Tower and yes if I leaned over the balcony I could see the top of it. What more could I ask for, the street alone was stunning and I was in Paris. A walk across the Eiffel Tower grounds and I was in Rue Cler, the cobblestone pedestrian street filled with shops run by people who all have a love of good food. To Parisians, shopping for food is a daily occurrence, partly because their kitchens and refrigerators are so small and partly because of their obsession for fresh produce, but most of all because Parisians love to socialize over food. They love to kiss the cheeks of friends; twice is customary and three times for friends you haven’t seen in a while. The shops on Rue Cler spill out onto the streets. They have all the essential gourmet ingredients available; wine cheese, chocolate, pastry and bread, all at individual shops. I’m amazed that shops can survive by selling only one item. 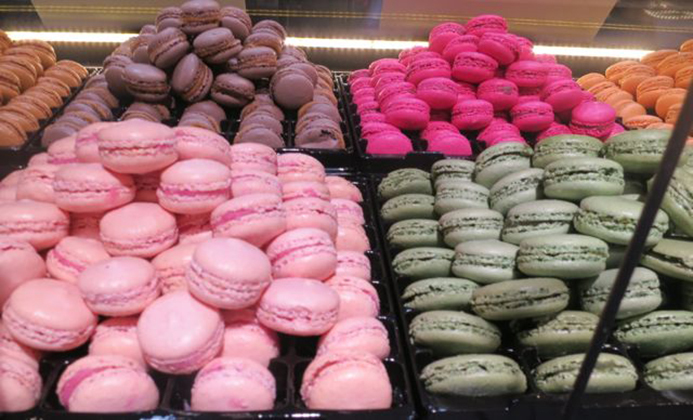 There is a macaroon shop with nothing but brilliantly coloured, small, cream filled macaroons. The tiny shop is jam packed full of these tempting disks of deliciousness and customers wander in and come out with tiny boxes filled with them, so did I. As usual, it’s best to go hungry and buy the wine last because the right wine is most important. 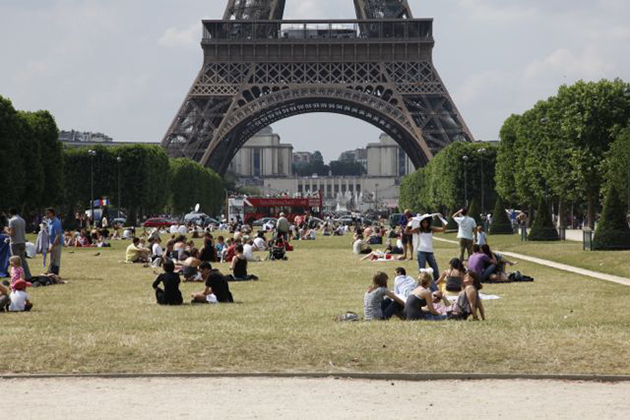 I pick up some cheese, pate, bread and wine and head back to the park at the base of the Eiffel Tower for a beautiful picnic. At any time of the day there are hundreds of people sprawled out on blankets, nibbling on food, sipping on wine or just lying together in love. I spread out my blanket and pull the food from my bag only to realize I had no corkscrew or glass. No problem, the couple next to me hold out a glass of wine to keep me going while they remove the cork from mine. They shared their charcuterie and I shared my cheese – life was good. How wonderful to be in a country where needing a corkscrew is cause for a rescue. 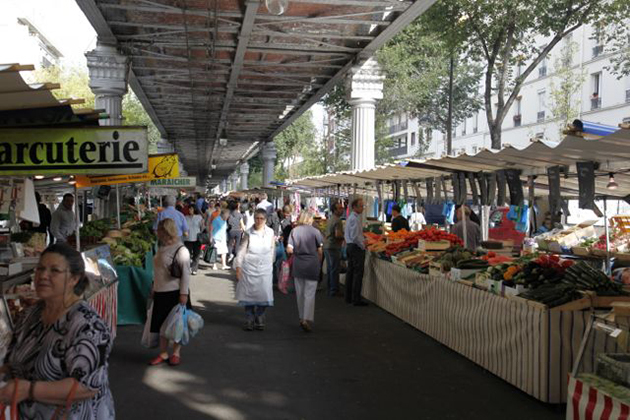 Two blocks behind the apartment, next to the metro station is the Grenelle Market. The sights and smells come alive on Saturday and Wednesday mornings in this narrow market that stretches four, maybe five city blocks long. Here you can get everything you can imagine from the very best and freshest produce to wine and gourmet foods, from hardware to shoes and stylish clothing. You can get anything at a Paris market. There is a frienzy around some of the vendor’s so I push my way to the front of the crowd to find the biggest pile of absolutely irresistible cherries. It’s cherry season and I’ve never seen a pile this big before, it makes you just want to lean into it and begin eating. Leo, as the farmer was called, scoped out a large bag of cherries for me and I began to eat as I shopped. I picked up some escargot stuffed with garlic butter and a fresh baguette. I looked at the wine tired from the heat and remembered a little shop on the way back home that had a fine selection and thought perhaps that was the wisest course of action. 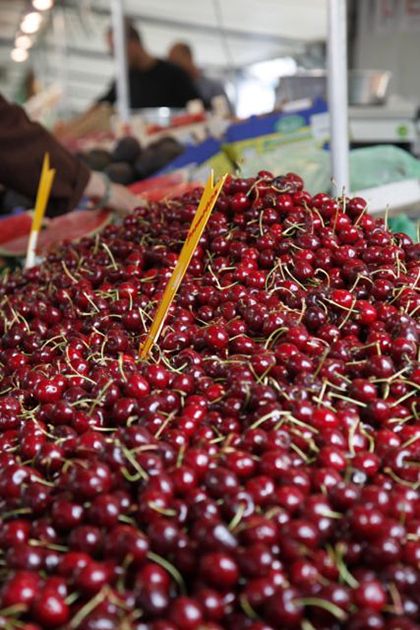 It took me a while to walk the entire market, it was almost closing time as I walked passed the pile of cherries again. The farmer was taking down his chalkboard sign and scratching a new price for the cherries. They were now half price – only 1.99 Euros per kilo. Once back at the apartment I threw the wine in the refrigerator, the bread on the table and spilled the escargot into a baking pan. All I had to do was to make sure they were all facing upwards so I wouldn’t loose any of the sweet juices as they cooked. 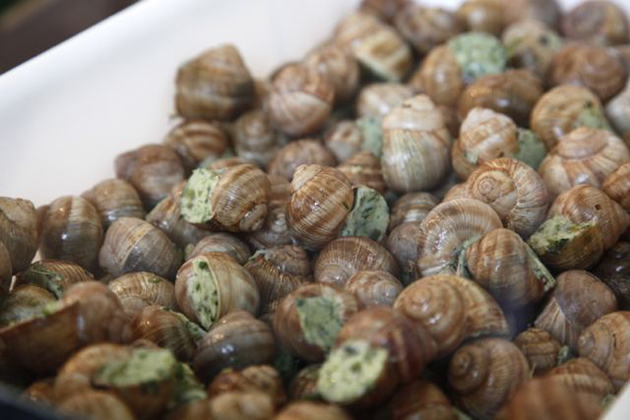 Escargot are sold in their shells throughout Paris but they are already cooked. First they’re washed, then removed from their shells and cooked while the shells have another washing; then they’re stuffed back into their shells with a generous amount of garlic butter. It’s so easy to pop them in the oven for a few minutes. The day was hot so I chose a sparkling rose from the shops cooler. The clerk knows his wine and recommends bottles based on what you’re going to eat. In fact, he recommends you call ahead with dinner plans and he’ll put a bottle in the refrigerator for you. Today was my choice and I choose a cremant de Loire from Langlois for the bargain price of 12 Euros. The clerk grunted his disapproval as I shoved the cold bottle into my bag. I don’t care, it’s what I wanted. Dry, pink with a soft fruity character and the bitter edge of the bubbles worked well with the sweetness of the garlic butter. 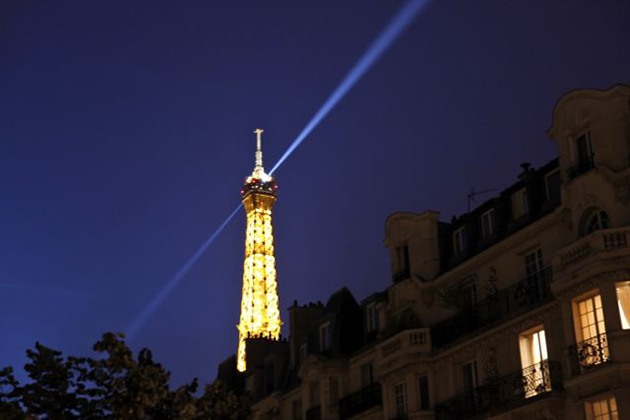 It was the perfect, most beautiful wine for the balcony of Rue Suffren overlooking the top of the Eiffel Tower.